Michael Phelps is having the time of his life—it was written all over his face. 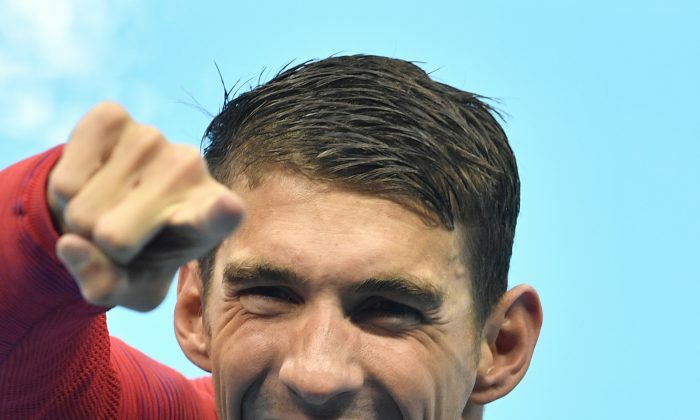 In the midst of receiving his 20th Olympics gold medal after winning the 200-meter fly final on Aug. 9, Phelps keeled over in laughter as the national anthem played. Social media users were confused about the sudden outburst. Real question, what was Phelps laughing so hard? I’m watching a clean feed of Phelps with no cutaways. why is he laughing?! OMG THE SUSPENSE. According to a report by Sports Illustrated, Phelps’s hometown friends were the reason behind his giggles. “My boys from Baltimore were down on the other end, and back in Maryland, we all say “O!” for the Orioles during that part of the national anthem,” Phelps explained in an interview with NBC. Apparently, its a common tradition in Maryland, as some Twitter users noted. However, some users wondered about the unfair criticism Gabby Douglas received for her behavior as the national anthem played. So folks are going in on Gabby Douglas about the national anthem, but Michael Phelps laughing during is okay? Um. Douglas, who was criticized for not placing her right hand over her heart during the gold medal ceremony on Aug. 9 clarified the situation in a statement.